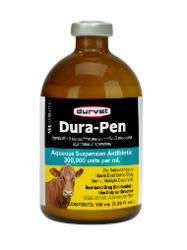 Indicated for the treatment of the following bacterial infections in beef cattle due to penicillin-susceptible microorganisms that are susceptible to the serum levels common to this particular dosage form, such as: bacterial pneumonia (shipping fever complex), upper respiratory infections such as rhinitis or pharyngitis blackleg. Effective dual-acting...Penicillin G Procaine and Penicillin G Benzathine. Dual activity - both fast acting and long-lasting. Broad spectrum of activity. Efficient and economical - reduces time, labor, and stress associated with frequent injections. For use on Beef cattle only. Beef Cattle: 2 ml. per 150 lbs. of body weight given subcutaneously only.